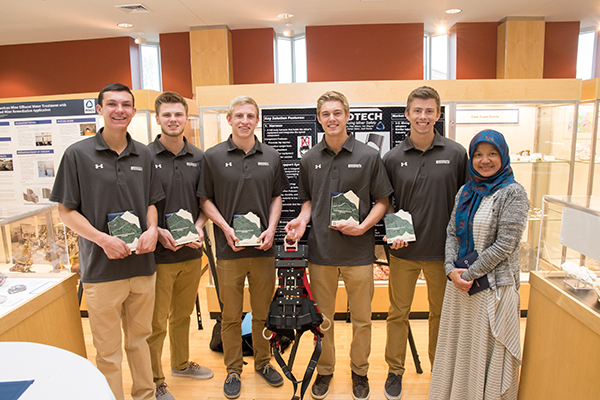 A team of first-year students took the $25,000 top prize in an annual challenge sponsored by Newmont Mining Corporation for a product inspired by a popular comic book hero, while an assistant professor of chemical and biological engineering was honored as Inventor of the Year in a celebration of innovation held April 13, 2017, at the Colorado School of Mines Geology Museum. The system includes a full-body harness that holds the miner’s equipment, a spinal support system that encourages good lifting form and a knee brace. The team consulted with biomechanical, materials and mine safety experts in designing the device and conducted market research to come up with an estimated cost and selling price and their target market. Rounding out the ExoTech team are Joshua Rands, engineering physics; Parker Steen, mechanical engineering; and Ben Topper, mechanical engineering. They were advised by Mirna Mattjik, teaching associate professor in the EPICS program. The $25,000 prize will be used to further develop their idea. Team PipeWalker was named Most Innovative and received $2,500 for its proposal for a device that detects stresses, leaks and breaks in pipelines. Members included Zachary Brand, mechanical engineering; Iker Madera, geophysical engineering; John Oldland, engineering physics; Max Sweeney, mechanical engineering; and Jenna Lucas, civil engineering. They were advised by Petroleum Engineering Teaching Professor Linda Battalora. Vader Technologies received $2,500 and the award for Most Market-Ready for a lightweight and comfortable respirator that’s an improvement on current devices. Humanities, Arts and Social Sciences Teaching Assistant Professor Greg Rulifson advised the team, which is made up of petroleum engineering students Dania Elmadhun, Fadhila Tanjungsari, Khadija Uzzaman and Carlos Perdomo-Correa. “You all are winners,” said Mike Aire MS ‘99, director of environment at Newmont and a Mines alumnus. “Just because you didn’t receive a prize tonight doesn’t mean you’re not going to get a call from us or some other company,” he said, addressing the other finalists. “I am struck by how farther along you are in your thinking, behavior and skills than I was when I was on campus,” said Perry Eaton ‘81, Newmont’s chief geologist and also a Mines graduate. “It gives me optimism about the future and the planet.” Eaton hopes the competition has shown students that there are many interesting problems to work on in the mining business. “That’s why we need bright young minds and innovative ideas,” he said. Assistant Professor Melissa Krebs was named Inventor of the Year for her work in three distinct areas: polygels, scaffolding for regenerating bone and glaucoma monitoring. “I’m incredibly honored,” said Krebs, who accepted the award with her two young daughters. 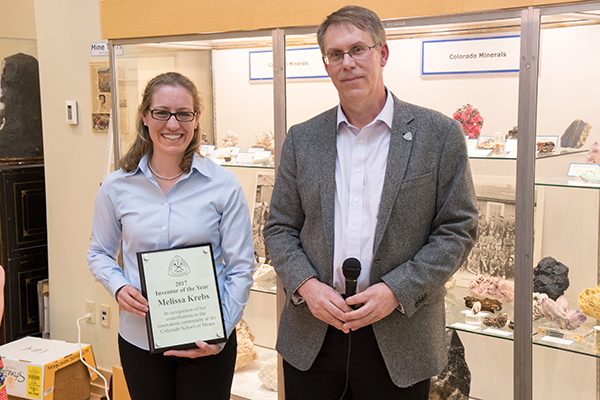 “It’s been a lot of fun to bring biomedical to Colorado School of Mines.” She credited the undergraduate, graduate and postdoctoral fellows in her lab, as well as her collaborations with the University of Colorado School of Medicine. 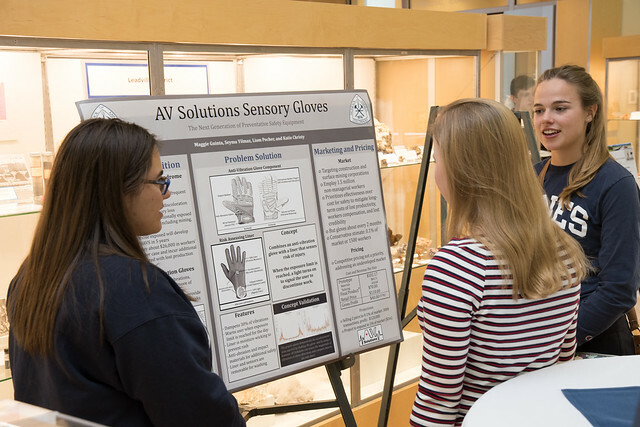 The event at the Geology Museum was also a celebration of the growing culture of entrepreneurship and innovation at Mines. “Just knowing Mines’ quality of faculty, the creativity of its students and our connections with industry, there’s no reason we can’t be an entrepreneurship and innovation powerhouse,” said President Paul Johnson. That innovation ecosystem has been in development for a couple of years, said Professor Kevin Moore, dean of the College of Engineering and Computational Sciences, and continues with the creation of the position of director of entrepreneurship and innovation. Werner Kuhr, who attended the event, is currently director of technology commercialization and industry professor of chemistry at Stevens Institute of Technology and will join Mines in July. Will Vaughan, director of technology transfer at Mines, said it’s been another successful year for the university, with six start-ups in various stages of due diligence. Also recognized at the event were Mines’ University Innovation Fellows, the students behind the makerspaces on campus and the revived Entrepreneurship Club. But that ecosystem also goes beyond the university and includes entities such as the city of Golden and Traxion, a Golden-based business accelerator.